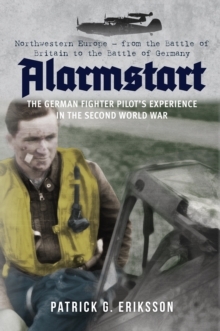 Alarmstart (scramble) charts the experiences of the German fighter pilots in the Second World War, based on extensive recollections of veterans as well as primary documents, diaries and flying log books, with photographs from the veterans themselves, many never previously published. For anyone interested in the air war 1939-45, the information provided is of inestimable value. There are no more than a handful of WW2 Luftwaffe members alive today. Patrick Eriksson had the foresight to record their experiences first-hand before it was too late. Some witnesses ended up as senior fighter controllers, and one was even a Luftwaffe psychologist. The recollections and views of the former pilots are put within the historical context of the German aerial war. By no means all the witnesses were from the ranks of the `aces', and the awful strain of the conflict is manifest: `My friend Leo, Kapitan of the 8/JG 54, in the last weeks on the Channel front developed insomnia, anxiety attacks. He was "flown out" (abgeflogen) and should have been relieved. He was shot down and killed in September 1940. 'This first volume covers Poland, Denmark and Norway, the Phoney War, the invasion of France and the Low Countries, the Battle of Britain, combating the RAF sweeps in the West, and finally, the Battle of Germany (home defence).